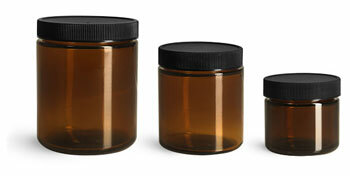 These straight sided amber glass jars with black ribbed polypropylene caps are a versatile combination offering style and durability for beauty care products and more. The deep amber glass color offers a unique look while providing a barrier for light sensitive products. The black polypropylene caps include F217 liners, ribbed sides for comfortable gripping, and matte tops for easy labeling. Be sure to test these amber glass jars with black ribbed caps in various sizes to ensure the best choice for your product line!